Free Scarf with Trichology Duo! + Save £10.50 on the Duo! Save 50% on Value Duos! American Crew is committed to offering men a great new experience and provide them with innovative ways to create new styles. American Crew Gift Sets are packed with the best products within the Haircare and Shave range to provide men with everything they need to help them look their best. American Crew is committed to offering men a great new experience and provide them with innovative ways to create new styles. Their haircare range recognize what is important for men, and what they need in a product to help them look their best. From shampoos to cleanse and hydrate your hair, to styling products that will hold the most outrageous styles, there is something for everyone. American Crew is committed to offering men a great new experience and provide them with innovative ways to create new styles. Their range of shaving products recognize what is important for men, and what they need in a product to help them look their best. From moisturisers to shaving cream, there is something to ensure your skin is left looking and feeling great. View all American Crew products in one place! American Crew are a brand designed with men in mind! They have tailored their brand to enable men to access everything they need to create the perfect hairstyle. With passionate commitment they want to bring men into salons and show them how to incorporate style into their everyday lives. They recognise the importance of men and that they need in a product to help them look their best. Inspired by Elvis Presley’s embodiment of the ‘classic man’ American Crew makes ‘The King’ the icon of their products in 2016. 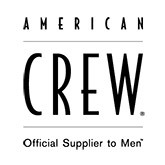 American Crew has received many awards for their male grooming products, in 2014 they were presented with the GQ award and were the proud winner of the 2015 Men’s Fitness Look Great award. American Crew Fiber – a product which will help you create a textured look with a matte finish! Best suited to both sort and medium length hair. This product is the winner of the best haircare product from Men’s heath Grooming in 2006, 2009 and 2010. 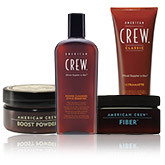 American Crew Grooming Cream – a cream designed to soften natural curls or waves, or give you a sleeker straight look. This product will leave your hair looking shiny and ensures the ultimate hold. American Crew Fiber – a product which will help you create a textured look with a matte finish! Best suited to both short and medium length hair. This product is the winner of the best haircare product from Men’s heath Grooming in 2006, 2009 and 2010. American Crew Forming Cream – This product gives a medium hold and leaves hair with a natural shine. With the use of Carnuba Wax and Glycerine Yield this styling cream will leave your hair in place for longer!